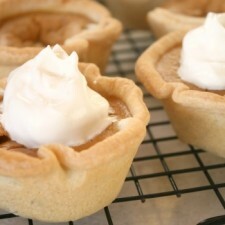 Thanksgiving is exactly one week away and in preparation, I made mini pumpkin pies. Pumpkin pie is a favorite holiday treat, but can be a bit tricky for those of us that are baking challenged. 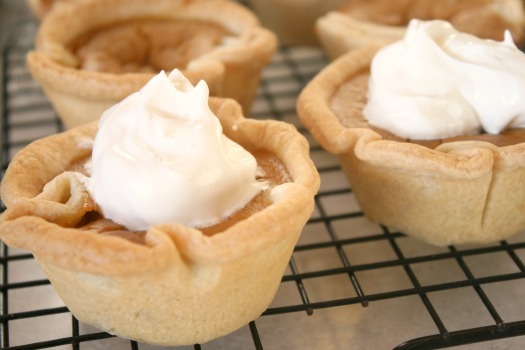 These pumpkin pie pieces are great bite size treats after a large Thanksgiving meal. 2. Roll out the pie dough until about 1/8 inch thick. Using a four inch cookie cutter cut out 12 circles of pastry. Spray the muffin tin with Kelapo Coconut Oil Cooking Spray. Line each muffin space with a circle of dough, gently pushing it down to the bottom and making sure it reaches just over the top of the pan. 3. In a bowl mix the sugars, salt, spices and zest together. Beat the eggs and add to the dry ingredients. 4. Add the pumpkin and mix together. Mix in the heavy cream and whisk until combined. 5. Fill each pie shell with the mixture until almost at the top of the shell. Bake for 15 minutes. Turn the oven down to 350 degrees and bake for 45 minutes or until the centers of the pies are firm. 6. Let cool, add whipped topping, and serve. I hope that all of you enjoy a wonderful Thanksgiving full of delicious desserts! What is your favorite holiday treat?